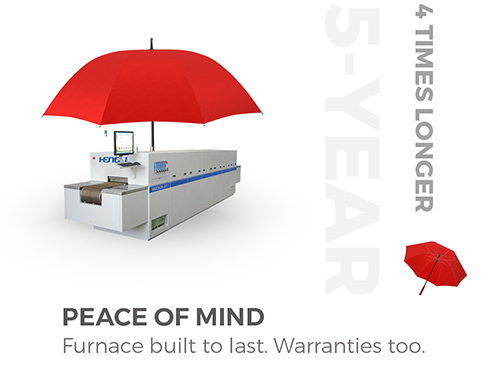 NOW 5-YEAR WARRANTY FOR OUR THICK FILM FURNACES! * As we did after Hurricane Sandy, we are giving away solar powered battery chargers to support our customers, partners, and all those we will potentially work with, especially who have been affected by Hurricane Irma and Harvey. Rated power of these chargers is 10W. It will take an hour to fully charge you cell phone in strong light. You only need to pay $10.00 shipping & handling. Please fill out the form below with "free solar charger" in the comment area or send an email to sales@beltfurnaces.com. FURNACES BUILT TO LAST. WARRANTIES TOO. We have a lot of confidence in the quality and durability in every new thick film furnaces installed in North America. So much confidence, that we offer an industry-leading THT 5-year warranty program.Thats 500% of our competitors warranty! The extended protection of THT 5-year warranty program gives THT Thick Film Furnace owners added peace of mind against unforeseen service and repairs. THT 5-year warranty program covers repairs made to precise THT standards and requirements. You can rest easy knowing your Thick Film Furnace is in the skilled hands of THT trained service technicians. All warranties are limited. Torrey Hills Technologies, LLC warrants all of its Thick Film Furnaces to be free of defects in Material and Workmanship for a period of FIVE year from date of installation by end user. Torrey Hills Technologies, LLC will repair parts found defective. The above stated warranty does not apply to products that have failed due to improper installation, misuse, alteration, unauthorized repair or modification. All implied warranties, if any, are limited in duration to the above stated FIVE-year warranty period. TO TAKE ADVANTGE OF THIS OFFER! ACT FAST! This warranty program is available on a limited first-come-first-serve basis.